Would you make a good journalist? Take our career test to find out how you match with this and over 800 other careers. What is the workplace of a Journalist like? A journalist is someone who investigates, collects and presents information as a news story. This can be presented through newspapers, magazines, radio, television and the internet. Journalists are relied upon to present news in a well-rounded, objective manner. are directly involved in the gathering of information. They conduct interviews, find sources, and pull together all the information needed to write a well-rounded news story. 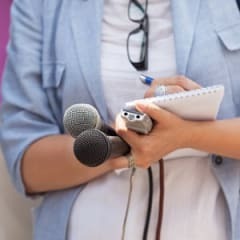 Reporters also present the information in a written or spoken form in news stories, documentaries, or feature articles. General reporters cover all kinds of news stories, but some may specialize in certain areas such as sports, politics, or lifestyle. Some reporters may work on staff for large news organizations, or as freelance writers, writing stories for whomever is paying them. take stories written by reporters and put them into a form that suits the special needs of their particular newspaper, magazine, or website. Sub-editors do not gather the information themselves but rather they concentrate on how existing stories can be better tailored to match a specific audience. use photography as a way of reporting the news. They may cover events with a reporter, taking photographs to represent a written story or attend news events on their own, doing both jobs. A photojournalist must carry photographic equipment with them, and must make decisions instantly in order to capture important events at the time they take place. At times, they may be exposed to physical danger, crowds, or harsh weather. is in charge of deciding what goes in a newspaper, magazine, or news bulletin. He or she is responsible for the content that is to be written by the journalists and makes all final decisions. is the person in charge of all news journalists. They make all the decisions about what stories to cover and who will do the work. In large news organizations, the news editor may have a deputy, often referred to as the chief of staff, whose job is to assign reporters to selected stories. write longer stories, which give more background to a news story. This type of writing involves a lot more in-depth research to give readers a lengthy and informative article. Are you suited to be a journalist? Journalists have distinct personalities. They tend to be artistic individuals, which means they’re creative, intuitive, sensitive, articulate, and expressive. They are unstructured, original, nonconforming, and innovative. Some of them are also enterprising, meaning they’re adventurous, ambitious, assertive, extroverted, energetic, enthusiastic, confident, and optimistic. Does this sound like you? Take our free career test to find out if becoming a journalist is right for you. Depending on the type of article being written, a journalist works anywhere they need to in order to produce the story. The workplace may vary, whether it's attending functions and big events or knocking on people's doors. Writing the article after all the information is gathered may be done in a hotel room, a coffee shop, an office or from home.